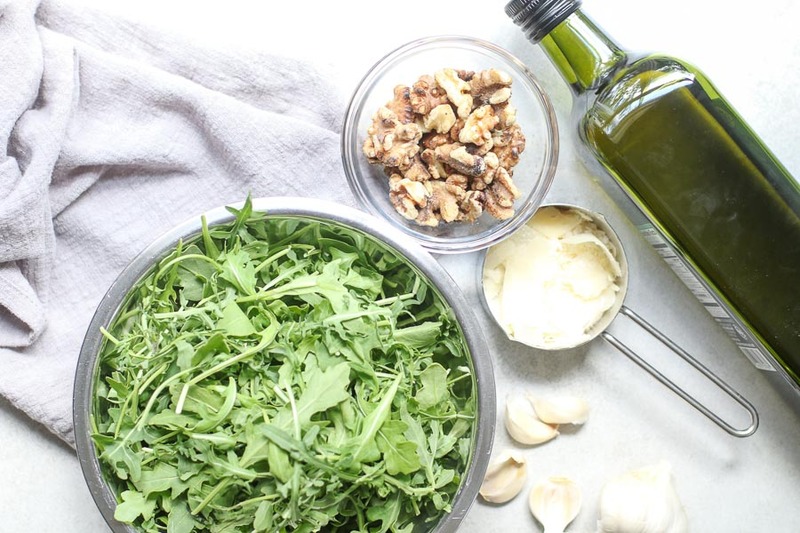 This homemade arugula walnut pesto is easy to make. Use up leftover arugula or other greens to prevent waste. It makes a flavorful spread, dip, or pasta sauce. I have a confession. I will make pesto out of any green. It’s my favorite way to use up greens before they go bad. Last week, I had a huge container of arugula to eat. When I got down to the last few cups, I decided to transform it into a pesto. 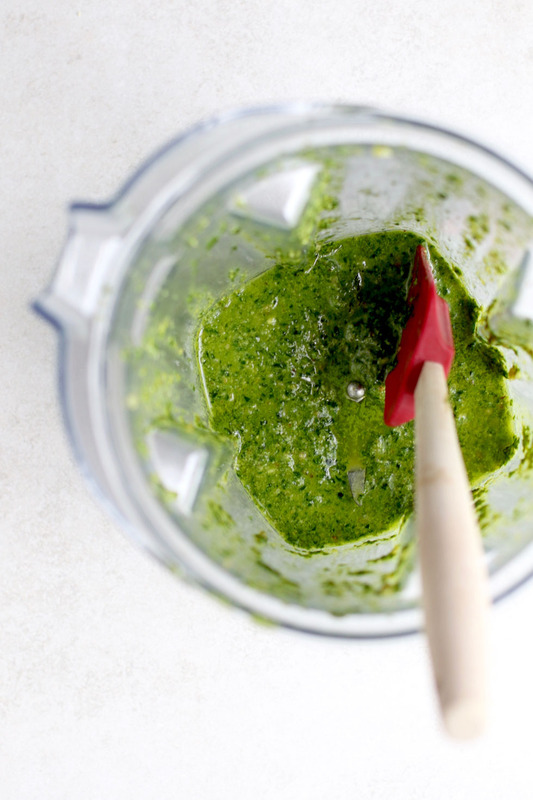 To make the pesto, you’ll need a blender or food processor. Well, I guess you could use a mortar and pestle if you are a true purist or a glutton for punishment. I’ve never tried one so I have no idea how that would actually work. I toss everything into the blender pulse a few times or hit puree. Making pesto is not an exact science. I like to play around with the acidity and the amount of oil. I’ll check it for flavor. Does it need more garlic, more salt, pepper? Is it too thick? Can it use more olive oil? Adjust it to your taste buds and texture preferences. With just 1/2 cup olive oil, this one is on the thicker side. It would make a hearty and flavorful base for crostini with tomatoes or white beans, a flavorful spread for a sandwich, or even a dip for crunchy carrots or pepper strips. 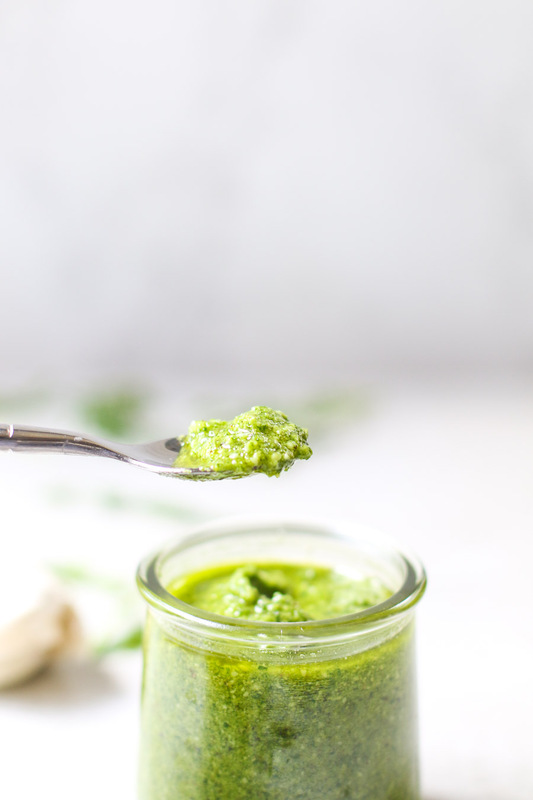 If you want to use this arugula pesto as a pasta sauce, you might want to make it a bit thinner. Store it sealed in the fridge for up to a week or freeze it in an ice cube tray into cubes then freeze for an easy sauce later. 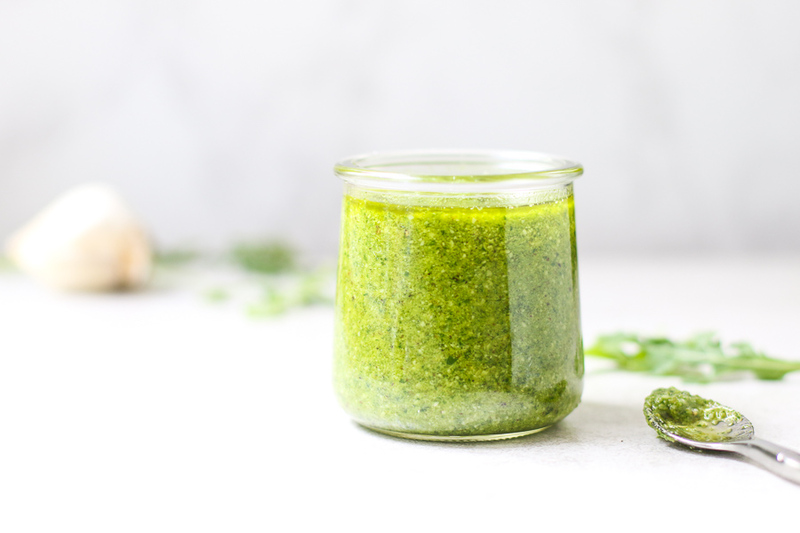 You can melt the cubes to make a quick and easy pesto pasta sauce, whisk it into salad dressing, mix with butter for a pesto butter spread for bread, or drizzle it upon roasted vegetables, eggs, fish, or chicken. The options are endless. So… I have a vegan pesto on chickpea pasta, a kale walnut pesto, a spinach basil pesto, and now this arugula pesto. I may be all pesto’ed out. I’m kidding. I know I’ll be making more pesto when it heats up again next year. Grab the easy recipe below. ere’s the easy recipe. Be sure to PIN it for later and tag me on Instagram when you make it! Place all ingredients in a blender or food processor. Blend until the mixture is pureed but be sure to leave some texture. Add additional olive oil if needed. Yields 1 cup of pesto. This pesto looks simply delicious! I LOVE arugula so this is a win for me! I love making pesto with whatever is greens and herbs I have lying around! 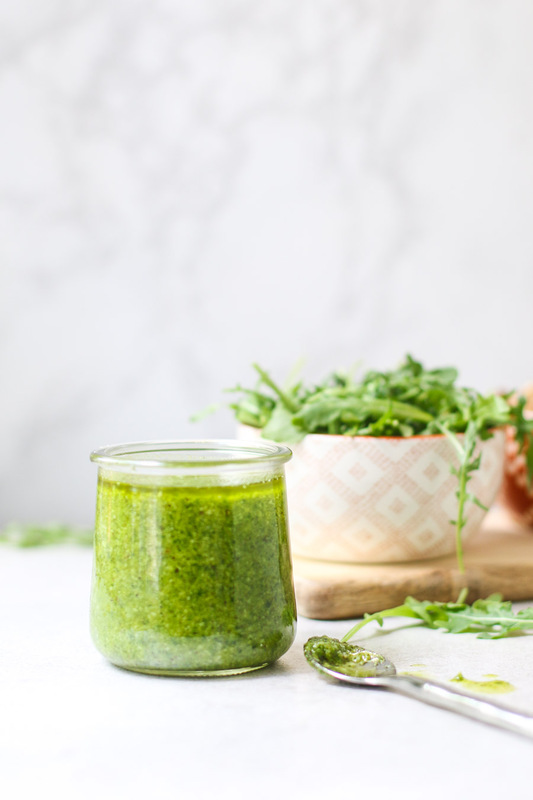 Arugula pesto sounds wonderful! This looks and sounds amazing! I can think of a million uses for it right now! Cannot wait to make it and have it ready to use! What a tasty twist on pesto. I love that you added vinegar, I bet this is SO flavorful! 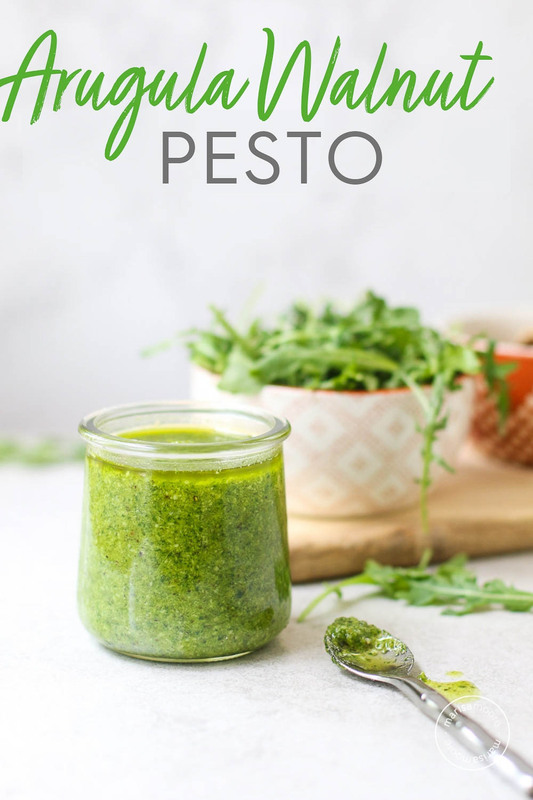 Such a great idea to use up greens to make pesto. I love switching up the nuts too! I love having pesto on hand for sandwiches! Loving the color of this pesto. Looks light and vibrant. I can't wait to try.